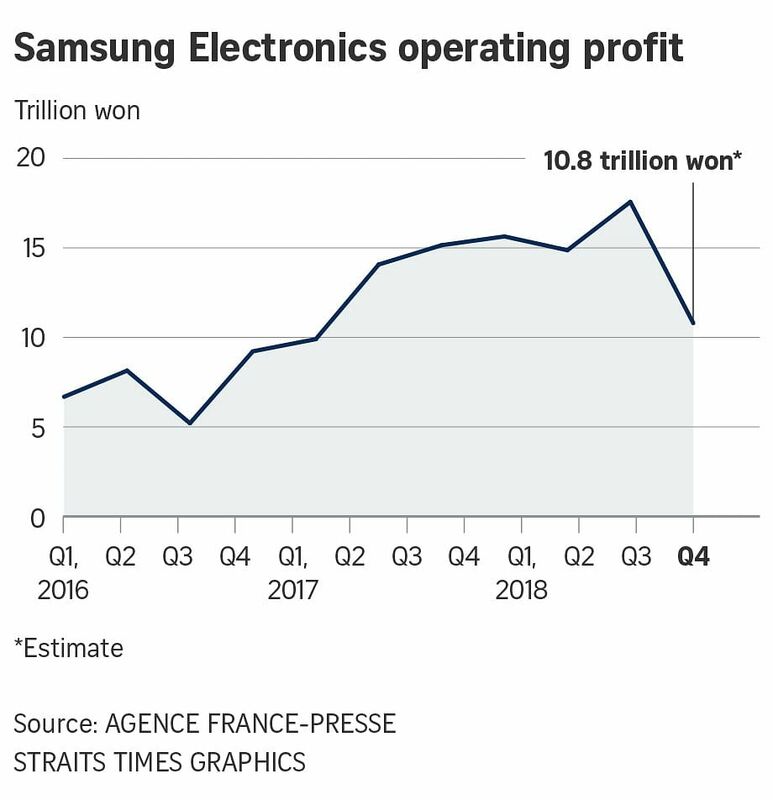 SEOUL • Samsung Electronics' quarterly profit and revenue missed estimates on sputtering demand for memory chips during the last three months of 2018, the same period when Apple saw anaemic sales in China. The South Korean company's operating income fell to 10.8 trillion won (S$13 billion) in the quarter that ended last month, according to preliminary results released yesterday, falling short of the 13.8 trillion won average of analysts' estimates compiled by Bloomberg. Deteriorating relations between the United States and China - Samsung's two biggest export destinations - have hit demand for memory used in everything from personal computers to mobile devices, raising the pressure on a company struggling to revitalise its smartphone business. Compounding that challenge is weakness at Apple, a major customer of components. The iPhone maker stunned global markets last week when it cut its sales outlook for the first time in almost two decades. "It's a shock," analyst Song Myung-sup at HI Investment & Securities said of Samsung's results. "It's not just Apple, but also smartphone, server and PC manufacturers that are not buying. While the US-China trade war hangs over them, these customers just won't accept current prices, and Samsung faces pressure to cut chip prices." Fourth-quarter revenue fell 11 per cent to 59 trillion won, compared with the 63.6 trillion won average projection compiled by Bloomberg. Samsung's shares fell 1.7 per cent in Seoul. The stock dropped 24 per cent last year. Memory chips account for the biggest portion of Samsung's profit. Contract prices for 32GB DRAM server modules fell about 5 per cent in the December quarter, according to InSpectrum Tech. Prices for 128GB MLC NAND flash memory chips fell about 3.4 per cent. Apple's surprise cut to its sales forecast last week suggested a worsening outlook for orders. Apple receives memory chips and smartphone screens from Samsung and is the South Korean manufacturer's biggest customer, according to data compiled by Bloomberg. Samsung said it expects earnings to remain subdued in the first three months of the year due to difficult conditions for memory. Profitability will recover in the second half, the company predicted, on projected improvements in the market, with rising adoption of new central processing units and launches of new smartphone products. While Samsung still leads the world in smartphone sales, it is being squeezed by Chinese handset makers like Huawei Technologies. The South Korean company is pinning its hopes on a foldable-screen phone that it plans to ship this year, along with a flagship Galaxy S10 model that is said to feature an in-display fingerprint sensor and a near-zero bezel. Mr Sanjeev Rana, a Korea technology analyst at CLSA, said, "In the second quarter, Samsung launches the Galaxy S10 and a lot of other Android makers announce new model launches that might help smartphone demand and enhance the demand for DRAM."